Learn Real History on the History Hub! New material will be added to the History Hub* on a regular basis. Check back often. Franklin Roosevelt's D-Day Prayer - "Let Our Hearts Be Stout"
A Patriot's History of the United States - Over the past decade, A Patriot’s History of the United States has become the definitive conservative history of our country, correcting the biases of historians and other intellectuals who downplay the greatness of America’s patriots. 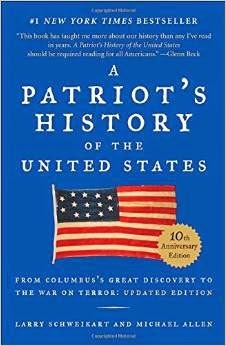 Professors Schweikart and Allen have now revised, updated, and expanded their book, which covers America’s long history with an appreciation for the values that made this nation uniquely successful. 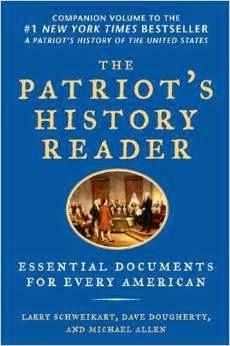 The Patriot's History Reader: Essential Documents for Every American - The Patriot's History Reader goes back to the original sources-the documents, speeches, and legal decisions that shaped our country into what it is today. The authors explore both oft-cited documents-the Declaration of Independence, Emancipation Proclamation, and Roe v. Wade--as well as those that are less famous. Among these are George Washington's letter to Alexander Hamilton, which essentially outline America's military strategy for the next 150 years, and Herbert Hoover's speech on business ethics, which examines the government's role in regulating private enterprise. Juliette Turner's Our Constitution Rocks! Juliette Turner's Our Presidents ROCK! I've been looking for a good, accurate history of the Crusades for a long time. I wanted a book that gives the #RealHistory of the Crusades, not tainted by political correctness, leftist ideology, or historical revisionism. It hasn't been an easy task, but in Dr. Thomas Madden's book, A Concise History of the Crusades, I finally found such a book. HIGHLY RECOMMENDED for those folks who want to understand the reality of the Crusades without the anti-Western, anti-Christian bias that marks much of the academic world over the last 50+ years. Dr. Thomas F. Madden is Professor of History and Director of the Center for Medieval and Renaissance Studies at Saint Louis University. *What, and Why, is History Hub? Watered-down by political correctness, and intentionally corrupted by ideological misinformation, the subject of History has been twisted beyond recognition in recent decades. History Hub is designed to answer the misinformation by providing resources for learning and teaching Real History. Here you will find the actual text of historical documents, famous speeches, and other primary sources that you can read for yourself. You will also find Real History articles by myself and others, book recommendations & reviews, videos, links to suggested websites, and other resources. Learn Real History for yourself, and teach it to your children.